Or, “Today I took Stefanie’s SWEAT class and I’m eating Broccoli for dinner so I’m being so GOOD”. Not all are appropriate for NYC life (keep sneakers in your car? How about your knapsack?) but most can fit right into a regular, healthy lifestyle. Walk or ride your bike to work. Try not to eat food portions that are larger than your fist. Do resistance training while you watch television. Implement an after-dinner walk with your family. Avoid eating lat at night. Our OPEN green HOUSE was a fabulous day filled with amazing local businesses, green products, healthy food and so many of our wonderful community taking it all in. NY1 agreed with us and stopped by to film some of the happenings. Check out the video below! While all this was happening, we also launched our KIDS SONG CONTEST with a submission deadline October 31st. We got Nathan Tysen (professional musician and all around nice guy) to create a melody, verse and chorus, and have invited kids from all over NYC to write additional verses on what they do to be green everyday! The winners will star in a professionally produced video, along with some other great prizes. Is your kid the next eco idol? click the link below to see Nathan and a few of our talented 14th Street Y kids singing “That’s Why I Go Green”. While we’re proud of the work we’ve done, we’re still continuing our journey towards and greener building and a greener world. Do you have ideas? Would you like to join us? Please email us at Greenteam@14street. Our Theater has had a full summer of greening and renovations. It’s now time for the theater to be a theater! Becky Skoff, Theater and LABA Manager gives us an update on what we can look forward to this season. This fall we have two exciting rental productions coming to the Theater at the 14th Street Y. To lay her brother’s soul to rest, a young refugee must escape the relentless Man on the Horse, chased through the wilds of Sudan down into the landscape of her own mind. With riveting action, surprising humor and beautiful puppetry, We in Silence Hear a Whisper explores the redemptive power of connection and how the greatest tragedies only happen when we look away. The Red Fern Theatre Company (RFTC), founded by Emilie E. Miller and Melanie Moyer Williams in March 2006, strives to provoke social awareness and change through theatrical productions and outreach. Each play produced by the Red Fern Theatre Company addresses social issues that range in scope from local to global, and each production is paired with a philanthropy whose work relates to the social themes of the play. Untitled Theater Company #61 (UTC61) presents the New York premiere of Pangs of the Messiah, by noted Israeli playwright Motti Lerner. The year is 2014, and Israel is on the verge of signing a peace accord; in the West Bank settlements that Israel may soon abandon, no one is celebrating. Lerner’s tense drama focuses on the Head of the Council of Settlements and his family as they struggle to retain the life they have built-in anticipation of the coming of the Messiah. The play provides a rare window into the lives and psyches of the settlers from an insider’s perspective. It is a family drama with broad political implications. Lerner is one of Israel’s most produced playwrights, and his work has been seen in the United States at the Public Theater, the Williamstown Theater Festival, Baltimore’s Center Stage, and numerous other venues. He is particularly known for his political writing, with numerous plays that examine the facets of the current Israeli-Palestinian conflict. Untitled Theater Company #61 is a Theater of Ideas: scientific, political, philosophical, and above all theatrical. I was that kid in elementary school who couldn’t even get herself up to the chin bar during the presidential fitness test. I’ve recently come across this blog “nerd fitness”, which is just fabulous, and this particular post shows you the way to build strength in order to do that ONE PULL UP! Or several, it’s up to you! Here is an excerpt posted below. Good stuff. They work all of the “pull” muscles in your body – your back, biceps, forearms. They are indicative of your level of fitness – anybody that can do a pull up is in pretty good shape…anybody that can do 10 or more is clearly in great shape. And damnit, pull ups make you feel like a badass after doing them. However, pull ups are also hard as hell, especially if you’re just getting started. Unlike other exercises that can be completed with just your body weight (like squats, lunges, and push ups), pull ups and other exercises that strengthen your pull muscles require at least one piece of equipment! On top of all of that, if you can’t do one yet, how the heck are you supposed to work on them to get better? This weekend every newspaper that you read and every channel you watch will be about what this city went through 10 years ago. Whether or not you lived in New York 10 years ago, you were a New Yorker by virtue of being American, or even being human. It was a day when we saw the true consequence of what happens when one puts their ideology over their humanity, and we all wept together. I was a New Yorker 10 years ago. I lived in a cool studio apartment on 14th and 7th, and I taught fitness at the 14th Street Y. That Tuesday morning I taught an early class at 7:30AM and was walking home afterwards along 14th Street when I heard a very loud plane above me. I was on the corner of 14th and 3rd. When I reached Union Square, I heard what seemed like billions of sirens all at once. Moms reached down into their kids strollers, covering ears. Must be some fire, I thought. When I reached 5th Avenue, I saw people standing at the corner gawking at something southward. All I could see were large trees from where I was walking. I got to 6th Avenue and saw the north tower smoking like a large cigar, and everything I’d seen and heard up to that point made terrible sense. But I was on my way to the grocery store, and I continued walking there with my legs growing more leaden with every step. So I stopped at the corner of 14th and 7th with a group of people, all of us looking south, all of us in various states of disbelief. We didn’t speak. I looked to my right and there was a man dressed in a suit weeping. “Are you alright?”, I asked. “All those people.”, he said. Yes. All those people. I went home and called my mother. She picked up the phone, and I said, “Mom. I’m okay.”. “Did something happen?” She asked. After that, I remember just sitting in my loft bed for a while watching it all on TV. And then I wanted to get outside. I saw the people lined up for pay phones, gathered around car radios, and then more people covered in soot, walking north across 14th Street. The next day after that terrible one, I walked to the 14th street Y. I was supposed to teach a morning class, but because very little staff could make it in due to the lack of transportation I stayed to help. I also saw a desperation from this community. We were all desperate to help. Our fitness studio was transformed into a room full of food, clean socks, fresh towels and clothing. This was meant for the first responders, many of whom came to the Y to shower and refresh. It rained the next few days, and nothing was open below 14th Street. In many ways, the Y was a place where people could mourn together, to help in some way, to say thank you to those who were bearing the brunt, to be a part of the mourning and to begin healing. It wasn’t long before we heard about Manny DelValle, a great friend of the Y and firefighter from the firehouse next door-and the mourning began afresh. Every year since that one, I think about the 14th Street Y and what New York was like in 2001 . I am so grateful that the Y was here, because it gave me a way to help and be in communion with others. Since then, I’ve brought two children into this world, changed careers, and moved from my studio in Chelsea to larger apartment with my family. This neighborhood has changed some, but the Y in its essential state has not. This is where we can come together to build community, educate our kids, spend our retirement, get healthy and share who we are. I am so grateful to live in New York City. I am so grateful that the Y is a place where humanity overrides ideology. -Camille Diamond is the Director of Community Engagement and Community Relations at the 14th Street Y. Please feel free to share your memories with us here! Did you notice a big dumpster filled with wood in front of the Y Wednesday morning? Well, green fans, no worries- this dumpster wasn’t headed for a landfill, but to a recycler. 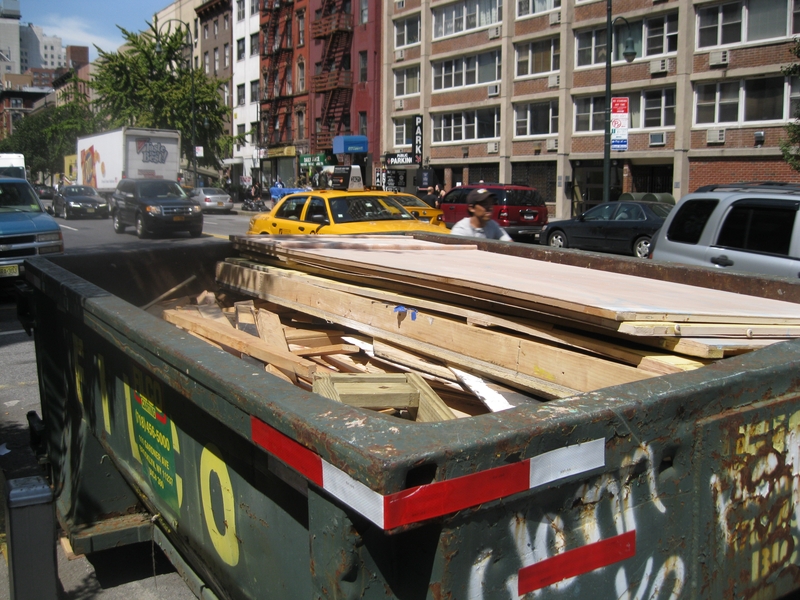 This is the second summer in a row we have recycled wood from the theater using Filco Carting– a company referred to us by the folks at Broadway Goes Green. Where does all this wood come from? Last year, we had 12 productions in the theater. Each production builds a set, and sometimes extra seating, for our flexible black box theater. At the end of the production, they break down the set, leaving large piles of wood. Two summers ago we discovered that the old policy was to require theater companies to take any wood from their shows directly to the dump. This cost theater company time, manpower, and a fee for disposal, not to mention the impact on the environment. Recycling is expensive, and the companies just were not able to do it with their limited budgets. We brainstormed and made some calls, and last summer during the renovation of our theater floor we built a reuse and recycle center in our theater loft. We recycled all the wood from the old stage (five tons!) and started fresh last fall, and began a policy that theater companies could leave their wood, set pieces, and furniture from the productions in our theater for the next companies to use. For the entire 2010-2012 season, no wood was thrown out from our theater. We collected it, and the wood has been used by our preschool for art projects, to build shelving in our art room, and for art installations in our lobby. Three productions were able to build their sets almost entirely with our wood, and almost every production used our wood pile in some capacity. We now have a full stock of theater platforms built from this wood, which are incredibly useful, and have saved theater productions thousands of dollars in building or renting similar structures. As we prepare for the next season, we simply had too much wood to continue storing, so we did another clean out and recycle. We don’t know exactly how much wood we saved from the landfills this year, but we are guessing it is about 2 to 3 tons. This means in the past two years, we have we have saved at least seven tons of wood from reaching landfills. Instead, Filco will recycle the wood, much of which becomes mulch for city parks.